The word “blockchain” sounds self-explanatory in meaning, but there’s so much more to the term that comes down to one thing: decentralization. Centralized systems have been natural parts of our everyday lives for ages. For any matters involving U.S. federal law, for instance, one must report to the centralized federal government based in Washington, D.C. To electronically send money, a person must use the services of centralized businesses like a bank or money transfer provider such as Moneygram. Even the Internet itself is centralized, as users must gain connection to the Web through Internet providers like Comcast and AT&T, which process connection requests through centralized private servers that store data including website files and databases. Though centralization may seem like a concept that provides order and convenience, it actually creates a vulnerability that has been exploited increasingly over the years as technology has advanced. If all of the information and operational power for a service is concentrated in one entity or location, a hacker only has to worry about targeting that one entity or location and its centralized components to steal valuable information. This form of attack can cripple a business and industry, leaving customers of a business to deal with loss of service and possibly loss of privacy and resources. Decentralization is presenting compelling evidence that it is the answer to this problem, and blockchain technology is the vehicle that is making decentralization happen. Since 2009, the cryptocurrency Bitcoin has been demonstrating the unprecedented power and efficiency of blockchain technology. Bitcoin works by using advanced cryptography in the open-source software Bitcoin-QT that runs on multiple computers called nodes. 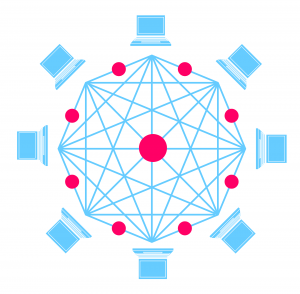 These nodes form a peer-to-peer network in which they work jointly to keep a public ledger of all Bitcoin transactions. It is this public ledger that is called a blockchain, and it stores transaction records like those of a purchase or money transfer in groups called blocks. Whenever there’s a new transaction record to add to a blockchain, it must be discovered through mining, the competitive process of cracking complex digital hash codes performed by miners. The miner who is able to identify the code leading to the transaction first is awarded an allotted amount of Bitcoin, and the transaction gets validated and added to the blockchain of previous transactions. Each node in the peer-to-peer network maintains a copy of the blockchain ledger, so every new transaction must get broadcasted between the nodes so that the addition of that transaction to the blockchain can be reflected on all of the nodes’ ledgers. If all of the nodes fail to confirm a transaction with 100% consensus, the transaction does not get validated and consequently is not added to the blockchain. This decentralized and encrypted process of transaction validation for Bitcoin makes it more secure than centralized validations. The reason for this is because multiple components, the nodes, must be infiltrated in order to for thieves to take control over the decentralized system, whereas the takedown of a centralized system requires penetration of only one main component. The more nodes there are, the more secure the decentralized system becomes. This revolutionary method of transaction processing in cryptocurrency has caught the eye of other industries, and now major technological developments are under way to apply the versatility of blockchain technology to other fields. Here are just a few areas that are preparing for the utilization of blockchain to take their capabilities and performance to higher levels of security and reliability. Record transmission and accuracy are vital functions that can be plagued with problems like human errors and lost data in industries like healthcare. Blockchain technology shows promise in the ability to reduce such problems by enabling networks of hospitals, medical practices, and insurance companies to safely communicate and share information in an efficient way that can improve things like cost calculations, accuracy of diagnoses, and timely administration of medical treatments. Such improvements would ultimately provide more cost-effective and quality care for patients. The blockchain startup Tierion is working with the blockchain lab of healthcare giant Philips to create a platform that provides secure data storage and data verification of healthcare records outside of a centralized database. Voting elections are events in which accuracy and fraud protection are critical. Blockchain technology has shown that it has the ability to significantly improve both of those factors with its public ledger feature that can serve as a public, permanent record of votes tallied in an election. This ledger can help ensure that votes have not been altered, removed, or fraudulently added, which can help eliminate contestations and recounts. Follow My Vote, a blockchain voting startup, is working to make blockchain voting a reality with its open-source, online voting platform that operates on blockchain technology. Artists and businesses can have more control over their video content by distributing it to followers and customers through blockchain technology. By using blockchain to release videos, they can control who gains access to their videos, eliminate time-consuming advertisements, and directly engage with their viewing audiences. Identifying the valuable potential of blockchain-based video streaming, White Code Labs has created Stream41, a live video streaming platform that utilizes Ethereum blockchain. It is a decentralized platform that will allow video content creators to safely create and stream live videos, charge their viewers to access their video streams, and share the links to their streams with anyone. Stream41 will also allow the video creators to withdraw the earnings from their streams without any service fees. Is Decentralization the Way of the Future? The adaptability, security, and performance that blockchain technology delivers compared to traditional systems demonstrate the superior benefits of decentralization over those of centralized systems. As blockchain makes its way into more industries, will it eventually lead to making everything in life decentralized? In addition, will everyone completely embrace blockchain technology and its decentralized structure? Blockchain does have its opponents, and it is relatively new, so it may be too early to determine its long-term impact on people and everyday life. Again, blockchain technology is showing itself to be a major player in the world of high-level, secure applications. To understand the security features of blockchain on a deep level, it helps to have a solid foundation in cybersecurity. Build that foundation by taking courses from Cybrary.